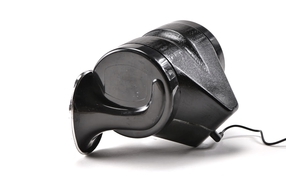 The Loud Bicycle Horn is designed to sound just like a car horn. 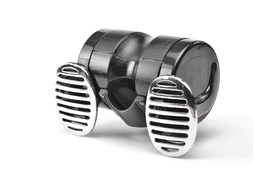 With both high and low notes it is even more perceptible than louder horns that only have a single note. Honking with your thumb is easy and won't interfere with braking. 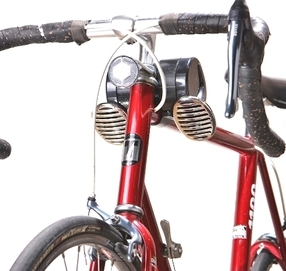 The button attaches easily to either handlebar and the wire plugs into the bottom of the case. The horns are easy to install but security bolts make it difficult to remove. The rechargeable lithium ion battery pack is light and powerful. With regular use, a single charge will last for 1-2 months. The Loud Bicycle Horn sounds just like a car horn and it is just as loud too.